I am hopeful that in the not to distant future I will start posting pics of the War Graves in Balgay Cemetery Dundee,I have one question,do I post them in this thread or do I start another of my own ? I had lots but p.c. crashed and I lost the lot. I hope I`m not standing on toes with this one.? Looking at some of the other threads Gary, you just go ahead and post your pictures relating to Balgay in this thread. Please don't start a new thread, just follow on from Adam's original initial message. It doesn't matter if you don't manage to find and photograph them all in the one go, but it would be best if you would post ALL the listed CWGC info, post that, and then add photos to each if and when you get them. That way the thread always matches the CWGC order and you can go back and forwards and edit your own posts. 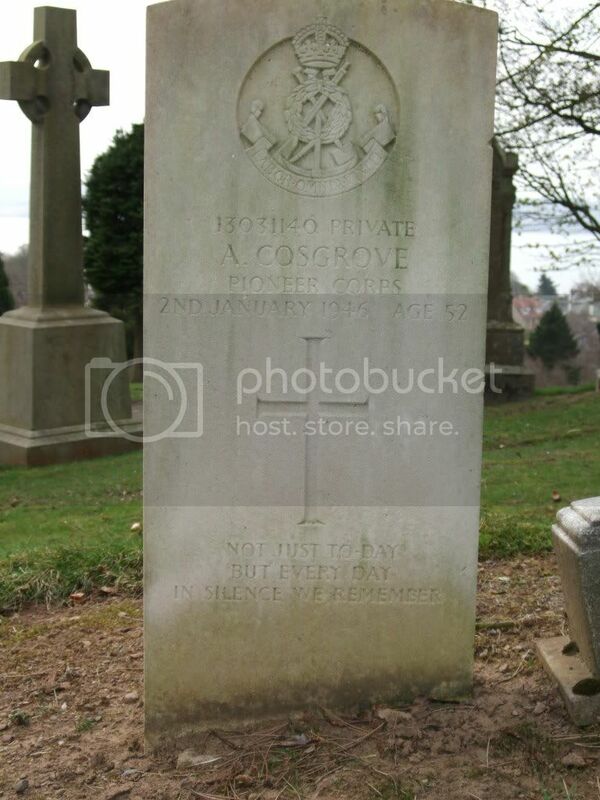 Additional information: Son of James and Mary Cosgrove, of Dundee; husband of Margaret Cosgrove, of Lochee, Dundee. Grave/Memorial Reference: Sec. E. Grave 184.